Reduce risk while increasing productivity and revenue. Hiring reputable vendors to perform work with your company or on your multifamily property is essential to the success and reputation of your business. At no cost to you, let us track all of that paper for your vendors and automate the vendor insurance tracking process. We background screen and TIN check your vendors to ensure you have the best information to adequately protect the assets you are managing. 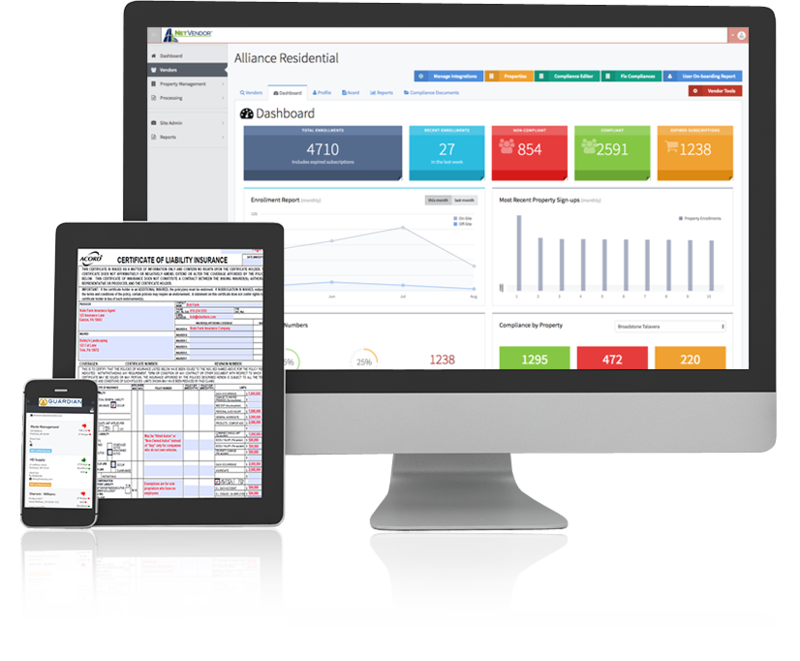 NetVendor multifamily property management solution is a real-time solution that automates vendor compliance for the properties that you own and/or manage. Using a single, centralized database, this innovative web-based solution takes the pain out of chasing down vendors and getting them approved to perform work for you while monitoring them throughout the policy period. Automating workflows assists you in working more efficiently, and our tool gets rid of the manual process and minimizes the errors that can occur that increase the likelihood of a lawsuit. NetVendor affordable housing solution is a real-time solution that automates vendor compliance for the properties that you own and/or manage. Using a single, centralized database, this innovative web-based solution takes the pain out of chasing down vendors and getting them approved to perform work for you. Whether you are managing Low Income Tax Credit (LIHTC), HUD, or Section 515 properties, our vendor management tool allows you one less item to be concerned about. NetVendor HOA property management solution is a real-time solution that automates vendor compliance for the associations that you manage. Using a single, centralized database, this innovative web-based solution takes the pain out of chasing down vendors and getting them approved to perform work for you. 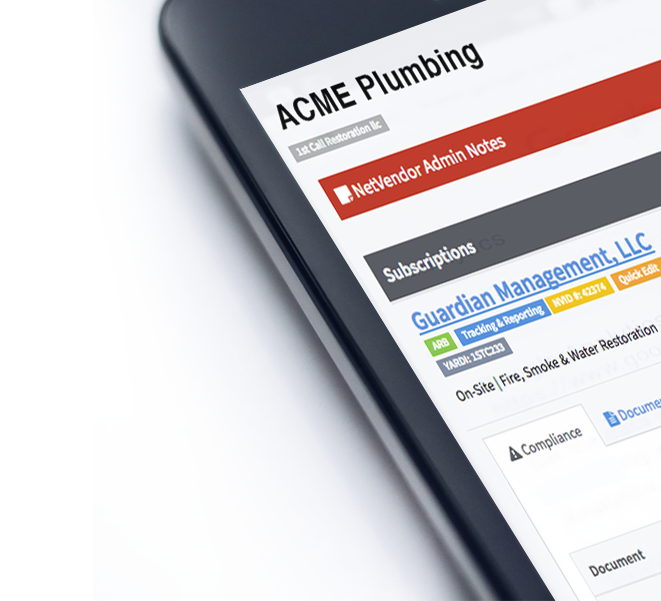 Automating workflows assists you in working more efficiently, and our tool gets rid of the manual process and errors that can occur and increase the likelihood of a lawsuit. Whether you are managing condos, co-ops, or neighborhoods, our vendor management tool allows you one less item to be concerned about. NetVendor commercial property management solution is a real-time solution that automates vendor compliance for the properties that you own and/or manage. Using a single, centralized database, this innovative web-based solution takes the pain out of chasing down vendors and getting them approved to perform work for you. Whether you are managing multi-occupancy offices to industrial areas, our vendor management tool allows you one less item to be concerned about. No matter what unique compliance needs your owners may have, our solution can meet the demands of any building. NetVendor Hotel and Motel management solution is a real-time solution that automates vendor compliance for all your properties. Through your company dashboard, you can see all your properties, vendors and their current compliant status in a single, centralized database, and allow access to that database to as many of your properties you like, allowing you to accept bids and schedule work with ease and confidence across your network. Let’ face it, whether you’re a small chain of boutique hotels, or an international conglomerate, The Hotel and Motel industry is about all about offering great customer service – and if this is your industry, then that’s where you want to focus your time and energy, not on trying to track down insurance Certificates and do background checks on the vendors who service your properties! NetVendor senior housing property management solution is a real-time solution that automates vendor compliance for the properties that you own and/or manage. Using a single, centralized database, this innovative web-based solution takes the pain out of chasing down vendors and getting them approved to perform work for you while monitoring them throughout the policy period. NetVendor military solution is a real-time solution that automates vendor compliance for the military. Using a single, centralized database, this innovative web-based solution takes the pain out of chasing down vendors and getting them approved to perform work for you. NetVendor health care solution is a real-time solution that automates vendor compliance for the health care sector. Using a single, centralized database, this innovative web-based solution takes the pain out of chasing down vendors and getting them approved to perform work for you. Outsourcing the administrative function of keeping your vendors compliant lets us do what we do best and allows you to allocate your resources to other more important areas of your business. Why is vendor compliance so important? In today’s litigious environment, it is paramount to ensure the vendors you are doing business with have met acceptable professional and insurance coverage criteria. What is the NetVendor screened & approved seal of approval? The vendor has an appropriate amount of general liability insurance. The vendor has an appropriate amount of worker’s compensation coverage. The vendor has passed an annual background check detailed above. All required licenses have been verified. The process starts by contacting us for a FREE consultation and demo. Create an account and give us your vendor list. Set your compliance standards and liability limits. Add vendors at any time, you will be able to view compliance status within 1-2 days once we receive your vendor’s documentation. You are automatically notified immediately if any compliance status for any vendor changes. There is NO COST to the property manager! Learn more about NetVendor’s Full Service Solution.